That being said, I am 100% guilty of overusing "awesome”. Which makes me wonder: is my vocabulary really this limited? Furthermore, does overusing a single word make me uneducated or lower the value of what I have to share? I can definitely see how it would turn some people off. I’ve actually tried to be mindful about it and I’ve censored myself a few times. I’m not necessarily trying to impress anyone, sound “hip” or offend; I write like I talk and, apparently, I talk like Teenage Mutant Ninja Turtle. I’m not certain if replacing awesome with a neologism is a viable course of action. I’ll cut it out for a bit while I consider the issue. 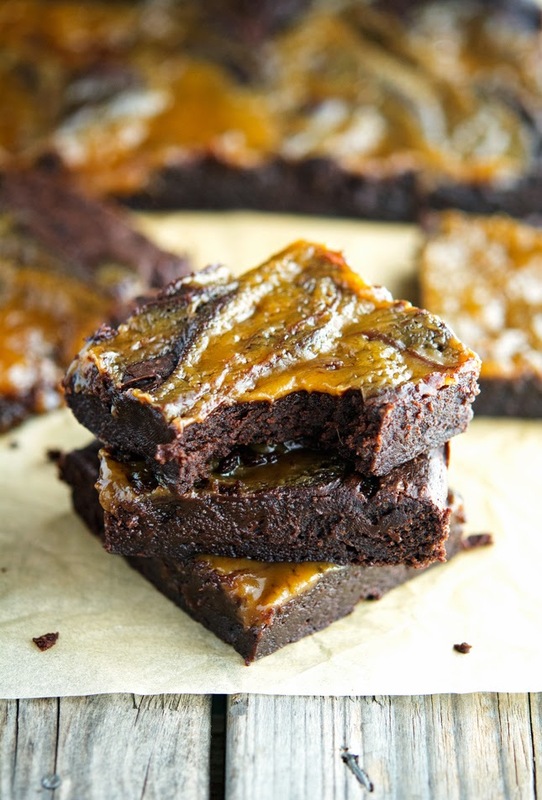 However, allow me to use awesome one more time, because frankly I can’t find a better word to describe these chocolate caramel avocado brownies. 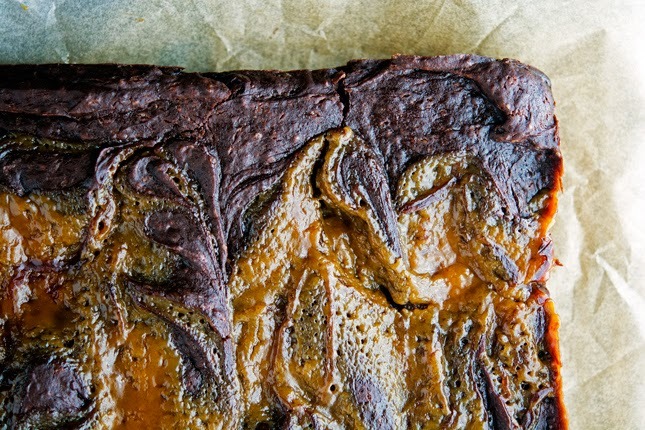 Fudgy, dense, gooey, sticky, and with the right amount of sweetness. Needless to say it, I made my own (paleo) caramel sauce, because it’s so easy to make and so much better than store bought (and it’s also dairy-free and refined-sugar free). All in all, these brownies were a success. Aunt G kept saying “Mike these are supergood! I can’t believe there’s no sugar, no dairy and they’re made with avocado”, while licking her fingers and grabbing another piece. So just go and make them. We'll discuss how healthy they are later. 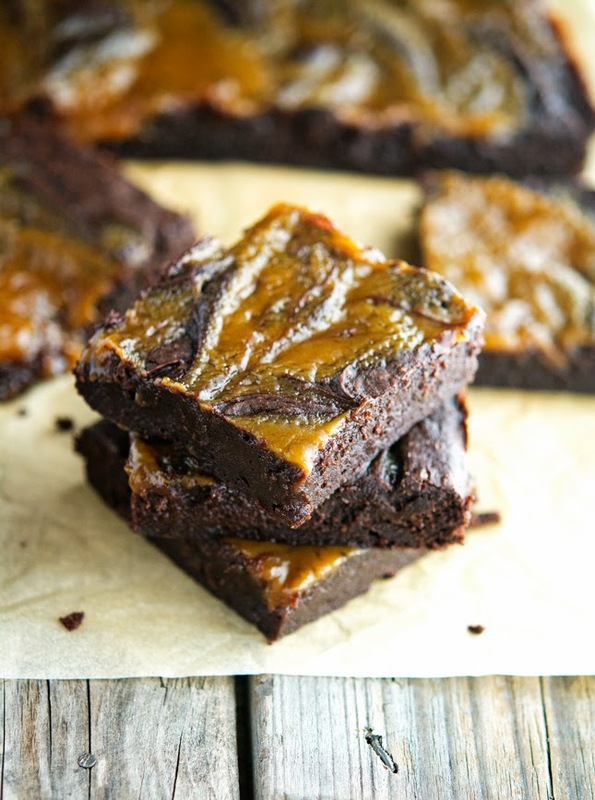 Chocolate Caramel Avocado Brownies Print this recipe! Grease a 8x8-inch baking pan. Line the pan with foil and lightly grease the foil. This will make brownie removal much easier. Place coconut oil and chopped chocolate in a medium size heatproof bowl. Place the bowl over a pot of barely simmering water, making sure that the bottom of the bowl doesn’t touch the boiling water. Stir with a wooden spoon until chocolate and coconut oil are completely melted. Use pot holders to remove the bowl from over the boiling water. Let mixture sit for a few minutes. In a large bowl, mash avocado until very smooth (I used an immersion blender to do this). Stir in the chocolate coconut oil mixture. Whisk in sugar until combined, then add in eggs (one at a time) and vanilla extract. Sift in cocoa powder, then add almond meal, baking powder and salt, mixing with a large spoon until just combined (do not overmix). Spread the batter into the prepared pan and smooth using a spatula. 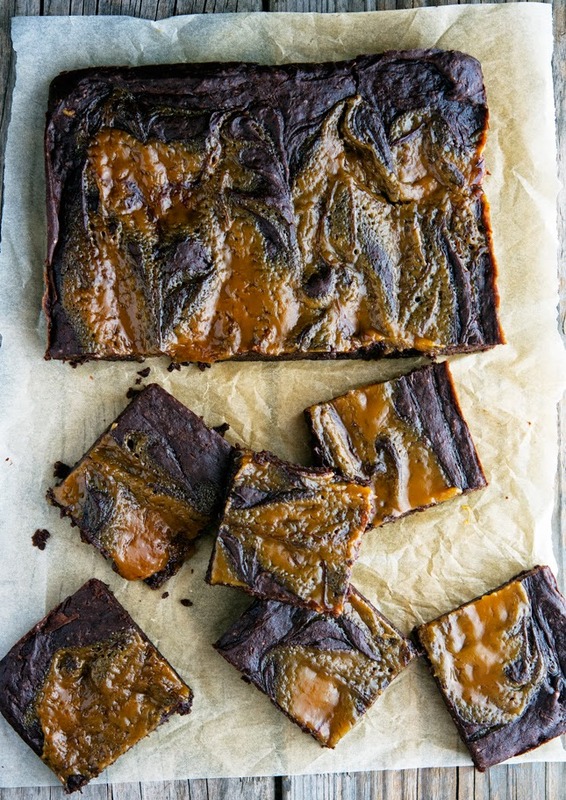 Take your caramel sauce, scoop out spoonfuls and dot them into the brownie mixture, pressing to submerge. Once you have a third of the caramel left, drizzle it on top, using your spoon to ripple it through. Bake for about 28 to 30 minutes until the middle is set. Let cool on a rack completely and cut into 12 squares using a sharp knife. 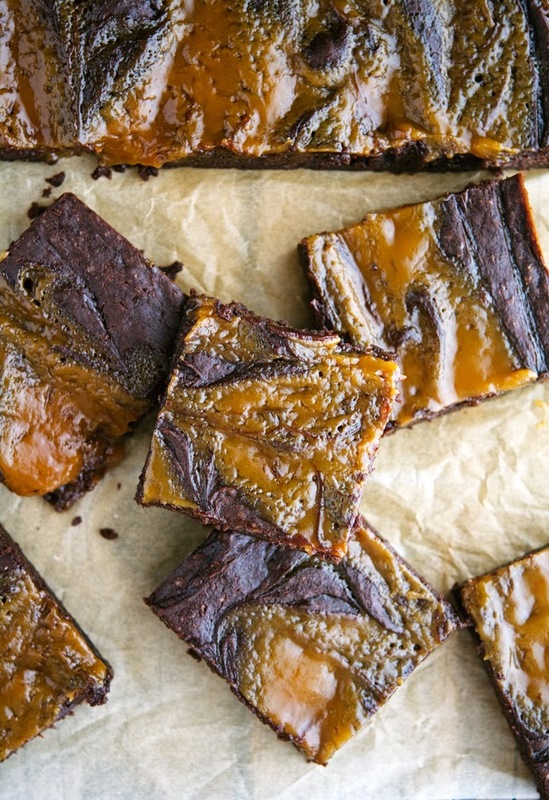 One brownie yields 327 calories, 29 grams of fat, 27 grams of carbs and 6 grams of fat. But seriously, they look bloody amazing. IMO they're the best treat after an intense training session! That's some serious fudgy decadence, and they look Awesome! Sometimes certain words are the only way to describe something properly! Hi Mike, between your avocado and cauliflower recipes you have to write a cookbook, they are so unusual and delicious!!! Love this! Thanks C, you're super sweet! Baking with avocado is "awesmazing"!! Ooh I am loving your nephews word! You know, I ADORE healthy desserts and I could polish off a half pan of these easy! That caramel sauce...why, its just awesmazing!! YOU are awesome. Have to try these! These are almost too beautiful to even think about eating (I did say almost, didn't I?). Can hardly wait to try, thanks for the recipe! That's fantastic, if you do try 'em please report back! I haven't heard that expression in years, you crack me up D.
You've combined some of my very favorite things in one title! I especially like the addition of avocados in brownies because that means it''s now super healthy and I can eat it for breakfast. Avocado and chocolate is where it's at B, healthy and sooo good! Can I be honest with you L? I do struggle quite a bit with coconut flour, especially in baking. I don't know why, but there's something about it (especially the way it interacts with other ingredients) that I still haven't quite grasped. I need to get more experience under my belt! I'm hoping it's 9 grams of fat rather than the other stated 29 grams of fat... Could you clarify please? Firstly, it is amazing to stumble across another male blogger who is into all the things I am. and secondly- I may or may not have spent the last 2 hours stalking your recipes.Mike- you are a kitchen genius.